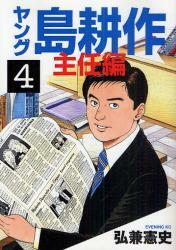 Metrolingua: I finished my third manga! I just finished my third Japanese manga: Young Shima Kousaku (ヤング島耕作), which is a prequel of the Kacho Shima Kousaku (課長島耕作) series. This one was almost 200 pages. It had lots of drama: office politics, blackmail, romance, cheating, and lots more! That's why I really like these: they're not fantasy but crazy dramas based on real-world work annoyances.